I’m surrounded by paddlers who have previously or are currently taking it to the extreme. I mean EXTREME! First descents down rapids and/or waterfalls that really defy what humans should be able to do and survive. Let alone do on a regular basis. It leads me to ask the question….why? What is the reason that these individuals who admit they’re scared, physically affected and cognizant of the risk will place themselves in this situation? The answer, while differing on the adjectives, all state the need to overcome a challange…or even a fear, if you will. To press their abilities to the edge. It’s an interesting notion and one that fascinates me on many levels. Again, why? There are so many things to be fearful of, if we let ourselves worry our brains away. Not being able to pay the bills, losing loved ones, disease or our own fragility. Perhaps this is why on some level we want to overcome a fear that is in our ability to control. Perhaps. On the other hand, is there strength in choosing NOT to run a rapid? I think so. Yesterday I was on a stretch of river I’ve run several times. For me, it has a few rapids on it that challenge me. I’ve never stood up through Spencer’s Hole on the North Santiam. I’ve done it coming down to a knee several times. Yesterday, however, I portaged the entire thing. The water was running a little higher. Again not really that big a deal. We even scouted it (which I think is worse for me…I’m almost better off, especially on a rapid I know, NOT seeing it first). We chose the line I’d run ON my knees. Sam ran it first, on his knees because I asked him to. I saw the line and thought “yep that’s totally doable”. For some reason though, I just didn’t want to do it. At this point in my life I’m okay listening to “my gut”. Did I feel great in the moment skipping it? Well, yes…and no. I will admit a feeling of “failure”. Like somehow it represented a weakness in me, my “badassery” (or lack thereof) or lesser skill in paddleboarding. On the other hand, I felt a sense of relief, and was able to enjoy the rest of the run and giggle through Mill City falls which I swan-dived. Hahaha. For me THAT’S what it’s about. If I’m not having fun there’s no point. I guess there’s no real “aha” words of wisdom here but maybe a suggestion that we might place too much emphasis on “conquering” our challenges. These, by the way, are self-appointed challenges and I’m fairly sure no one will think less of me as a human for having not run the rapid yesterday. Bottom line, it scared me in that moment, and while I’m sure I would have lived through the swim, I’m gonna stick with having fun…most of the time. If I accomplish some harder lines along the way, and overcome some small, manageable fears, well that’s just fine. Everyone else…well onward, and choose what’s best for you!! (I won’t think any better or worse of you). Trail Tales. They were Inspiring Conversations! Conversation With Inspiring Community Members” this last Tuesday at Deschutes Brewery Public House. As Jaymo pointed out, this was an “experiment” never done in this community. Candidly, I’ve found as much joy in talking with some of the potential future guests as the night itself and look forward to continuing this event. Our first guest was Meg Chun of Kialoa Paddles. 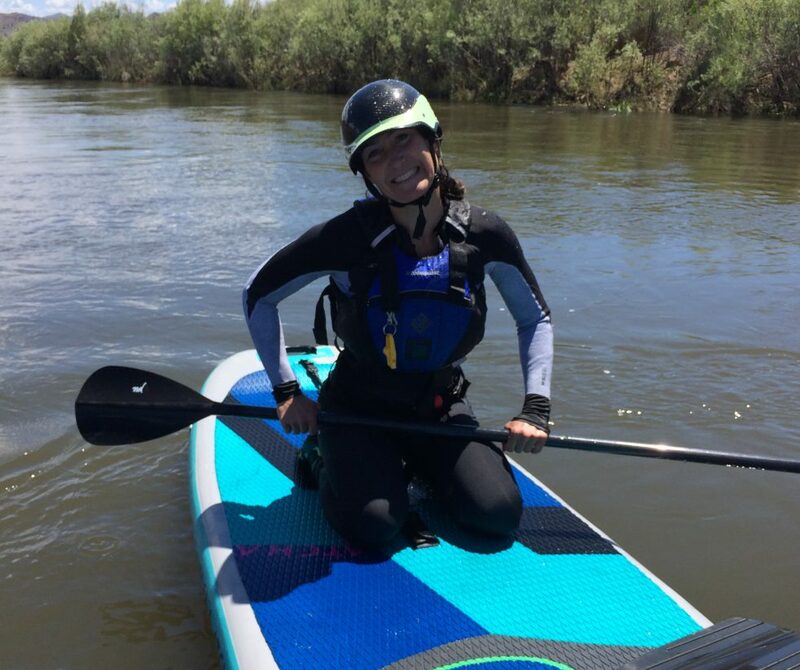 I have the utmost respect for Meg (as does the entire paddling community and central Oregon, I’m sure). She was a special ed teacher for years, before committing full time to the business side of Kialoa. As Meg pointed out, no one goes into education to strike it rich. It seems her approach (and Dave’s, her husband and co-owner of Kialoa) embrace that mindset with Kialoa. Inclusiveness, teamwork, doing right by your community. Seems to have worked out for them and for the many employees they’ve hired with Kialoa. From day one, Meg insisted that their employees have health insurance, as one example. Pretty cool eh? Our second guest was Alex Maclaren, one of the first pro bikers in Bend. His story was longer–but set the stage for a heart-felt description of how Alex went from being on top of the world and his involvement with the pro bike scene to a drastically different scene–a horrendous car/Winnebago wreck that he witnessed. His inability to help in any way led him, the very next day, to quit the biking world, go back to school and become a paramedic. How’s THAT for inspiring? One thing I want to make really super clear here… I respect with all my heart, those athletes that excel in their sport. Hell, I respect anyone who gets off the couch and goes for a walk rather than sitting around all day. I’ve had the honor of meeting all kinds of people–from Olympic athletes to famous film makers, to actors, to scientists who created amazing medicines. It all comes back to one thing for me. That you CONTRIBUTE. Regardless of how “big” or how “small” that contribution is, it’s something. You don’t have to be “the best” but you can be the best at how you act. Pick up that litter, give that afternoon to Habitat for Humanity, donate blood. Maybe just putting that smile on your face and LISTENING to a friend (or stranger) in need. We’re in this canoe together people…kudos to those who work toward paddling in sync. Another great weekend under my belt. Paddling, biking, catching up with friends and dancing with my sweetheart (yes, I’m a lucky lady who has a boyfriend who enjoys dancing!). I paddled with my boyfriend down a calm stretch of swiftwater on the upper Deschutes, with the exception of a couple class twos which meant some bigger waves and navigating some wood. A dichotomy to the race that was above my put in and below the take out….but I’ll get back to this. While visiting, Sam and I got into a discussion about “being the best”…the world’s best in some cases…and whether that is motivating or demotivating to the “average” person. It seems to me that we’ve gotten so hyper-focused on being the best at whatever sport or athletically based endeavor, that it can leave people uninspired to try, or at least feeling like an underachiever if they’re not hucking 360’s off the half pipe or running class 5 whitewater. Take the Olympics for example. Has anyone noticed the announcers talk about losing out on the gold as if it was a failure? Does this bug anyone else? I’m so amazed and impressed with the “next level” talent at such an event! Just for making it on the team–that’s a win in my book. Don’t get me wrong. I acknowledge there are a whole lot of people doing awesome stuff right here in our backyard. Which brings me back to this weekend. I went for two really fun bike rides. I’m strong but technically not advanced and probably never will be (although I just bought a new bike at local shop Pine Mountain Sports and I’m assured I’ll be able to do more with a bike that wasn’t built circa 2002). One ride was out at Phil’s Trail and the other good ol’ Rivertrail up from Lava Island. This was a quick and easy ride just to get my spin on before paddling and conveniently dropping Sam off to take photo’s of the “Hot Lava” race this last Saturday. This is a race down Lava Island falls which is considered an “easy class 5”. Ha…the words themselves make me laugh and while I know enough about paddling to understand what they mean, it still gives me a giggle. These great boaters did a “mass start” and ran this rapid down to Meadow Camp picnic area. There, I met Sam who paddled with me, on this very short stretch. Beautiful and easy, except for as previously mentioned, a couple class 2s that take some maneuvering that my first year paddleboarding whitewater, wouldn’t have gone so well. I’m not sure any of the boaters out there for the race would have registered there WERE rapids on that stretch (had they not been dating a “learning whitewater paddleboarder” for the last two years). It was short, fun, challenging at the end, and I took out right where the racers paddled Meadow camp, the local “town run” which was the real water. I felt great because it was a personal win for me. I’d read the water and charged it (with a little help from Sam, although I could barely hear him and would have chosen the same line). I ran the lines well and never bobbled. Like winning gold. For me. For the record, I don’t feel that any of the awesome boaters/SUP’ers I paddle with judge me, and they’re all super supportive. Sometimes I don’t think they comprehend the skills at which they perform, so they might not appreciate the effort (and sometimes fear) that accompanies my paddling, but they’re very positive and encouraging. So I ask YOU…how do you all feel when you see the social media out there? Extreme movies? Film festivals with experts doing amazing things right after the other? I hope you’re inspired…to do something…and it doesn’t have to involve hucking yourself off a waterfall. Hard to believe I’ve been teaching something for over two decades. I began my love of instruction with aqua aerobics, of all things. Back then no one really knew about this kind of exercise and I kind of winged it, to be honest…based on the “land” aerobics classes I’d taken in school. Many many certification courses and athletic clubs later, it’s a fundamental part of my week. It’s been a surprisingly fulfilling journey. Exercise and the motivation to do it comes easy for me. I’m lucky! For whatever reason I thrive when I’m moving and it’s no problem to get out of bed and get after it. However, I know that isn’t the same for everyone and that’s just dumb luck for me. So being able to get people stoked about moving for health is really gratifying. Especially those individuals that otherwise might not have options because of conditions such as injuries, arthritis, older age or deconditioning. When 80-somethings…or even 90 somethings, thank me for helping them have a more active lifestyle…well that just feels great. The reality is they’re doing this for themselves. I’m just the cheerleader, but it still feels nice. Nearly a decade now, I’ve also taught paddleboarding. First in Maui, to clients for a fitness workout and now in central Oregon who have taken my classes for all kinds of reasons. Some are honing the skills they already have, some for fitness and others because it’s a goal that they’ve created and they’re scared. Water isn’t typically their thing and they need support. I won’t say I have a favorite, but I WILL say that one of the reasons I teach, and a great joy of mine, is to be there for “the look”. That brightness in a new paddler’s face when they try SUP for the first time. Perhaps it’s someone who is stepping way outside their comfort zone. It’s like I’ve introduced them to chocolate. Or coffee. It’s clearly a highlight of their day and maybe their summer. THAT is job satisfaction. I believe water is therapy. It’s therapy for the body at times (I see that every week in my aqua aerobics classes). It’s therapy for the mind and soul too. In the times of my life that are stressful, my favorite place to be is on the water. In some form or another. It really doesn’t matter if it’s an ocean (or river) wave, rapids, flat water or a pool. Water is where it’s at for me. I’m filled with gratitude that I’m able to share that joy with others in a supportive way. So whether a pool, lake or river, give it a try if it’s something you’ve never done but want to do. I’m happy to help get you started–even if just talking you through where or how to start…. As I wrote the other day I’ve had a great summer so far. I love my time in central Oregon doing all the things that are so easily accessible that fit my lifestyle. But many of my fun adventures (and most of my paddling) in recent years has been in the Santiam canyon. Like many “Bendites” who have lived here since it was an itsy bitsy undiscovered town, I see the advantages to the growth. Working at Tumalo Creek Kayak & Canoe, I’d be unable to do what I do without that growth…as just one example. However, I’d be lying if I said I enjoy all that comes with the high density of people now living or visiting this area. My haven has become my “other life” in Gates and Mill City (I tend to lump them together even though they are, in fact, two different towns 3 miles apart). There, I can enjoy stunning hiking trails that I might see just a handful of people, if anyone at all. The Santiam river is not only gorgeous and uncrowded but also a perfect river for all levels of paddlers. It’s actually the Santiam river that I’ve learned most of my whitewater SUP skills because it has a perfect progression (moving backwards). What I mean by this is that a beginner can begin their paddling experience downstream and move their way upstream since the farther up you go, the more advanced it gets. It doesn’t hurt that I’ve had access to a paddling shop right at the put in and take out of two awesome sections of the river. Mehema to Camp Taloali (a private camp that rents out their cabins to groups) is an excellent class I/II stretch for beginners and was, in fact, my very first run on the Santiam on a paddleboard. Upstream is the Mill City to Mehema stretch which is also class I/II with some stout II’s (more challenging than downstream). Packsaddle to Mill City is probably the most popular stretch on the north Santiam. It boasts class II/III’s with Spencer’s Hole, Carnivore and Mill City Falls the most “noteable” rapids. I’ve never stood Spencer’s Hole all the way through but I’ve only fallen in the first time, typically taking a knee midway. I will never run Carnivore on a SUP but rather run the right side of the river (where you can’t even see the rapid) however I’ve been on a raft many times through it. Mill City Falls I’ve also never stood through but Sam has many times. Typically I go down to at least one knee through it and full disclosure…last time I swam. It ends in flatwater right above the take out…no worries. Above this is Niagra Falls which solid class 4 kayakers do all the time and above that, with some river in between including a dam, is the Bruno run. I’ve never run it…way above my level of paddling…but I hear it’s a hoot, from those boaters that have the ability. Remember I’m a Frisky Ripples kind of gal…ha! Once you’ve paddled whatever stretch you’re going to run, it’s almost sacrilegious to not eat at Papa Al’s. The place is always busy in the summer because it’s good, clean and reasonable cafe food (burgers, sandwiches and tots…oh the tots!!). In fact, I’ve rarely been to Gates without eating at Papa Al’s at least once. It’s right upstream from eNRG Kayaking, the paddle shop at the put in/take out where I visit constantly because of my relationship to Sam, but also because the crew is great. They’ve got equipment to rent and “oooops I forgot this” retail products (sunscreen, dry bags, basic spray skirts, etc) and a clean, new bathroom. Yup, no more using the public restroom across the street with cement floors…not that I’m complaining. The Santiam canyon is no Bend…thank God! It’s been a respite and savior for me to escape the crowds. My home away from home and a blessing. If you’re looking to try something new and haven’t paddled it, give it a try. Message me! I’ll paddle with you. And then maybe go home…haha…after eating some cheeseburgers. Thanks for listening and happy paddling! All kinds of great hiking! Paddleboarding can be a two-person sport! What a great summer!…and a fun day on the McKenzie. I am full of gratitude this August 10, with summer still in full swing, but with noticeably less time left before school starts, the tourists dwindle and TCKC shop hours go back to “non-peak”. This time last year I was unable to do most things I enjoy to stay busy… paddling, hiking, biking, yoga, etc. I was in a lot of pain and not sleeping well because of it. The smoke was really thick…labeled “hazardous” most days by the DEQ. To sum it up, relative to other summers it wasn’t at the top of my “first world” list. This summer, however, has been awesome. I’ve had too many fun adventures to really describe and my time off has been high-quality. I’m keenly aware of my health–that I’m NOT limping around–so every time I hit a hiking trail or paddle a cool stretch of water I’m thankful. I was with a group of women who all have interesting backgrounds. Each fairly new to the sport but with the exception of one, mostly comfortable paddleboarding on swiftwater. I think everyone came home with a “win”. Megan caught a surf wave for the first time “on the fly”. She’s impressive (for many reasons) but in this context, because she is paddling a hard board, meaning a non-inflatable. Way more challenging because it is more responsive (tippy). Yah Megan! Erica hadn’t paddled a bunch, especially class II’s, but did really well. For kayakers, class II’s might not seem like any big deal but standing up through them on a SUP. ?..well that’s a different story. It takes balance and practice. Christie has a unique background. She’s only been out two or three times on swiftwater with a SUP. However, Christie is a veteran class 5 kayaker who was sponsored and traveled the pro circuit for years. A decade at least. She knows how to read water, has no fear of class 2’s or 3’s and surfs river waves. She’s a natural. And also a totally cool chick. Erica’s sister was visiting from out of town and had never been on a paddleboard but thought she’d give it a go. That’s pretty fearless in my opinion. Way to go! We had our “Charlie”…in the form of Jayson who was also a long time class 5 kayaker and knew Christie from back in the day. Jayson supported us by raft providing us our hydration, lunch, endless encouragement and all-round great conversation. Really there was no drama or earth shattering stories to tell about that day. It was just plain fun. Everyone fell in at least once. Everyone stayed on their board in some stance or another through more rapids than not. We laughed. The weather was amazing. We all helped shuttle and prep and unload. It was a perfect day on the river. One like many more I hope to come. Thank you friends. Thank you mama nature and her waterways and thank you summer 2018 for being so grand. Also, beginning on September 11, from 7-9pm at Deschutes Tap room, in collaboration with Kris Jamieson of Backyard Bend, we will be presenting a casual interviewing/storytelling event monthly. Two guests from the community with fascinating and (hopefully) entertaining stories to tell from the paddling and outdoor rec community. Jaymo and I will laugh a lot I’m sure. That’s guaranteed. The rest of you is yet to be seen. Finally, in partnership with Sam Drevo and eNRG Kayaking, he and I will be hosting a Fall Fun Camp. It will be paddling-centric (raft, IK and/or SUP) but a bunch of camp activities on site at Camp Talaoli are available including frisbee golf, bocce ball, ping pong, corn hole, and an outdoor pool to name a few. All kinds of scenic hikes nearby, with one camp-shuttled hike on Saturday to Shellburg falls. Meals and campfires..complete with S’Mores included. Details to follow at enrgkayaking.com. Jaymo is one of my favorite people AND the first person I can recollect using the term “frisky ripples” with about 7 years ago. I probably remember it, because he loved the phrase and raved about it in a wonderfully positive, “quintessential Jaymo” kind of way. Just like how he uses the term “getting rad”. Which I’m pretty sure can refer to anything from surfing a double-overhead wave to his youngest son sliding into home base (unnecessarily…but just because). I met Jaymo about 7 years ago, walking the street in tiny Punta Mita Mexico where he was visiting a mutual friend…actually a friend of his, and a business connection of mine who was waylaid in Guadalajara. Because of the lag in schedules Jaymo, another friend and myself spent time paddle surfing, hanging out and laughing a ton. It began a great friendship and a unique C-change in my life (Jaymo is, in fact, the guy responsible for setting me up with Sam, my special squeeze). The reality is Jaymo and I don’t spend a lot of time together. He’s a loving husband and father of three awesome “kids” (one is almost graduated and damn near a legal adult). He’s beyond busy being that awesome family guy while also working a ton. So why do I write this post about him? Well Jaymo is, in fact…or at least in my opinion, based on observation and random rumors, a true “next level” athlete. From biking to snowboarding to surfing, the guy really can crush it. His resume is long and impressive…personally and professionally. His circle includes athletes and people from expert, to famous, to legendary status. But here’s the thing…Jaymo’s “getting rad” is very similiar to my “frisky ripples”. He’s certainly comfortable in the “next level” arena. But that doesn’t stop him from hanging out with me on waist-high waves. Or class II rapids. In fact, he thinks it’s awesome. He’s a super supportive guy that cares about people and helping them reach THEIR potential (whatever that looks like). In Bend, and in the industry I work, there are a lot of amazing athletes doing a lot of amazing things. We see it on social media and all the numerous film festivals and, for that matter, in person with our own eyes–on the trails, on the river and play park, etc. That is AWESOME! At times, however, I think us average athletes can lose perspective on why we engage in the activities we do…and that’s to have fun. (that’s why I do it anyway). Maybe to push or challenge ourselves. Maybe to improve ourselves. Or probably a combination of all of that. My hope is that I never let the fear or feeling that I don’t add up get in the way of me trying something new. I hope that’s the case with you people, in general. As a side note, thankfully in Bend there are a lot of ways to find access to trying new outdoor stuff. Certainly there are more options out there, but for biking, you might check out Pine Mountain Sports for their “Dirt Divas” (for you ladies) and bike clinics. A couple of my best buds swear by them! We have some great classes/programs at Tumalo Creek Kayak & Canoe locally…and I’d be remiss not to mention the awesome programs west of the Cascades for paddling..kayak or SUP…with eNRG Kayaking. And for more variety, Outside IN, a local retail shop in Bend that also offers fabulous events/workshops and clinics in a really accessible manner. I should mention I’m getting no credit for the shout outs here….the entities don’t even know what I’m writing. Once again…happy paddlin’ and thanks for listening!! See ya out there on the frisky ripples! !